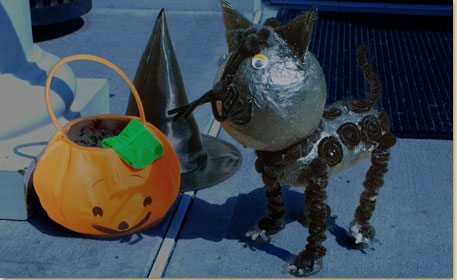 Make your own black cat puppet to scare trick-or-treaters! 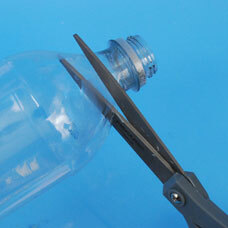 Using heavy duty scissors, cut off the top of the empty bottle. Have an adult perform this step. 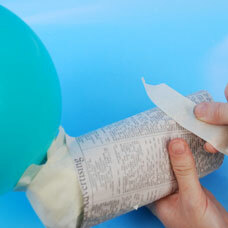 Blow up a balloon and tie a knot. Tape it to the end of the bottle (where there is now a hole). 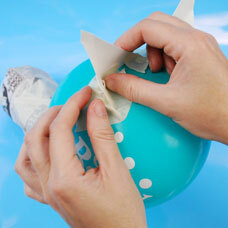 Attach the balloon so that the bottle lays horizontally behind it. The balloon will become your cat head and the bottle will be the body of the cat. 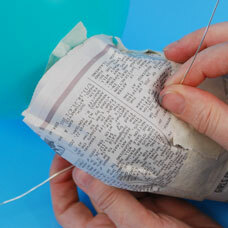 Wrap newspaper around the bottle to “fatten up” the form. 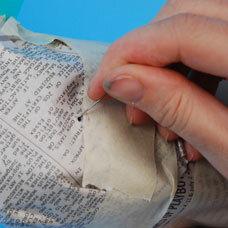 Tape newspaper to secure. 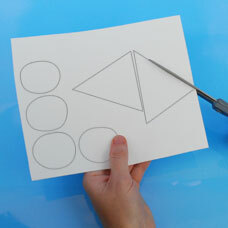 Take a piece of cardboard or card stock paper and draw (2) triangles for cat ears, and (4) ovals for cat paws. Cut out your pieces. 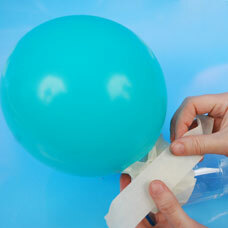 Attach your ears to the top of the balloon head with masking tape. Take (2) cardboard tubes (this tube came off of a wire hanger) and cut (4) pieces each measuring about 3 inches. Tape an oval circle to each cardboard tube to make the cat’s legs and paws. 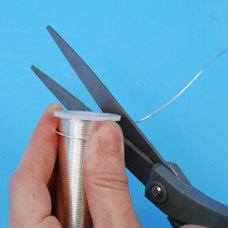 Take a large needle, such as a tapestry needle, and pierce each “leg” about 1/4 inch from the top. Cut (2) pieces of Craft Wire each to 2 feet in length. Pierce holes through the body of the cat’s sides with the tapestry needle for the front and back legs. 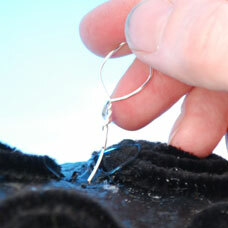 Thread (1) piece of Craft Wire through the front holes and (1) piece through the back holes. Thread a leg through each piece of wire. Secure the wire by wrapping the wire ends together on the top of the “cats back” and folding the ends close to the back to secure. The legs should now be able to move. 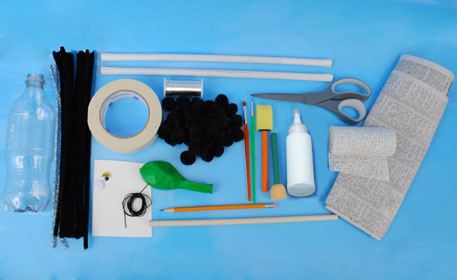 Add a tail by folding a black Fuzzy Stick in half and winding a third Fuzzy Stick around to first stick. Tape the Tail to the back of the cat’s body. Cover the entire cat with Plaster Rigid Wrap Cloth. *Take care to cover the legs carefully so that they retain movement. Also take care to carefully cover the area around the cat’s tail. 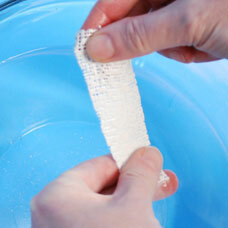 For more information on how to use Plaster Rigid Wrap Cloth click here. Allow the Plaster Rigid Wrap Cloth to dry overnight and then paint the entire form. 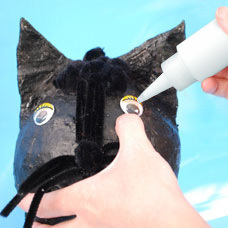 Decorate your cat with paint, Poms, Wiggly Eyes, Fuzzy Sticks or whatever craft material appeals to you and your child! For our cat we started by painting the entire cat black. 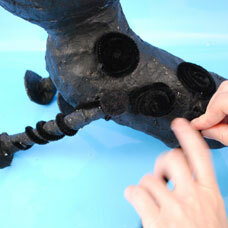 We then wound Black Fuzzy Sticks around the legs and added black Poms to the paws and to the top of the legs. Create claws by cutting up a Silver Glitter Stick into 1 inch pieces and gluing (3) pieces to each paw. To further decorate the cat, we created spirals out of Black Fuzzy Sticks and glued the spirals to the cat’s body. To Decorate the cat’s face we made a Fuzzy Stick nose with a Black Pom at the end, created whiskers with Black Fuzzy Sticks and used Large Wiggly eyes for the cat’s eyes. 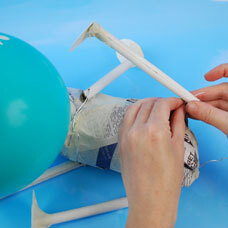 To attach the cat to a Wood Dowel and create the final moveable puppet, create (2) wire loops with Craft Wire. 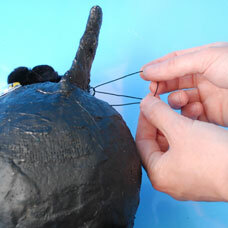 Glue the first wire loop on the back of the cat near the tail and the second loop on the cat’s head. 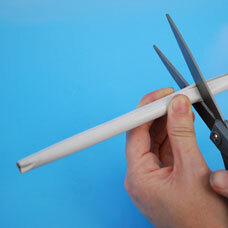 Cut a piece of Elastic Cord 2 feet in length. 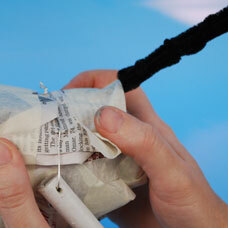 Secure the cord to each loop with a double knot and then add a dab of glue. 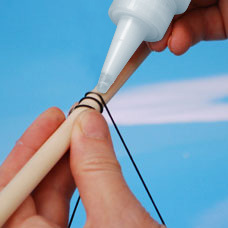 Wind the center of the Elastic Cord around a Wood Dowel and secure with a dab of glue. 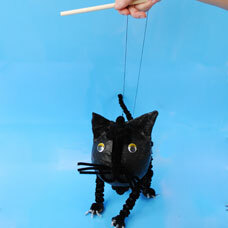 Use Wood Dowels to make your Kitty Puppet move!